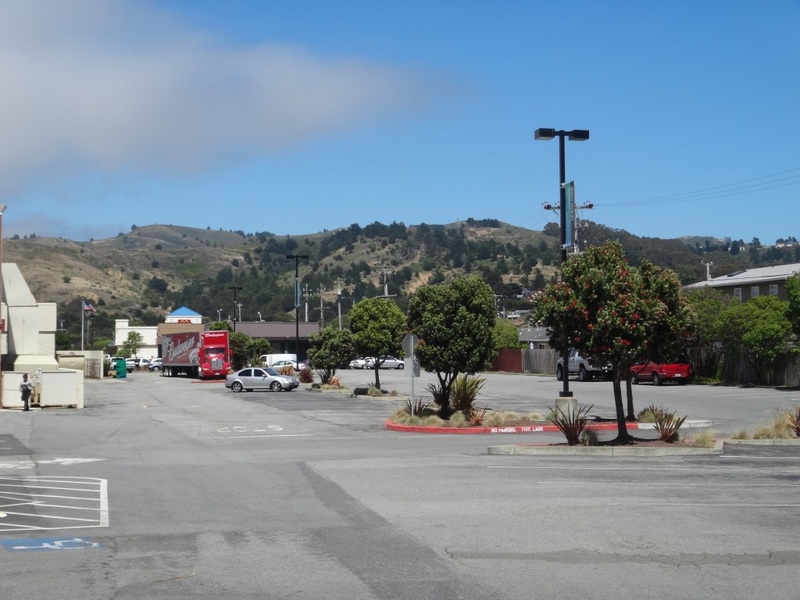 Photograph 1 - The San Francisco southern suburb of Linda Mar (in Pacifica). The San Andreas fault line follows this mountain range. If it shakes this place will rock & roll. 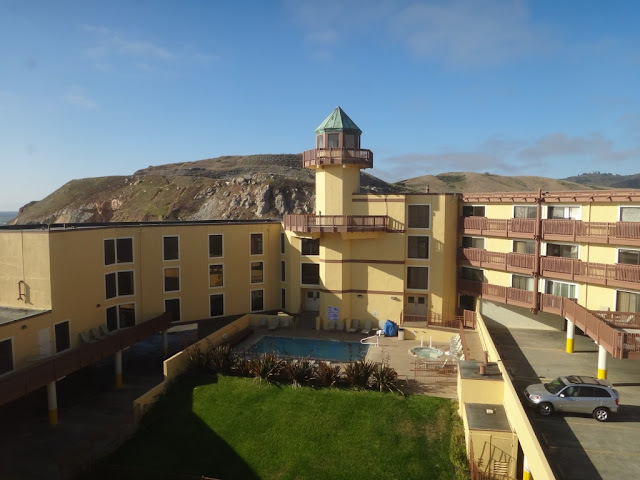 Photograph 2 - Our hotel is the Best Western Lighthouse Pacifica. It really is an observation deck. 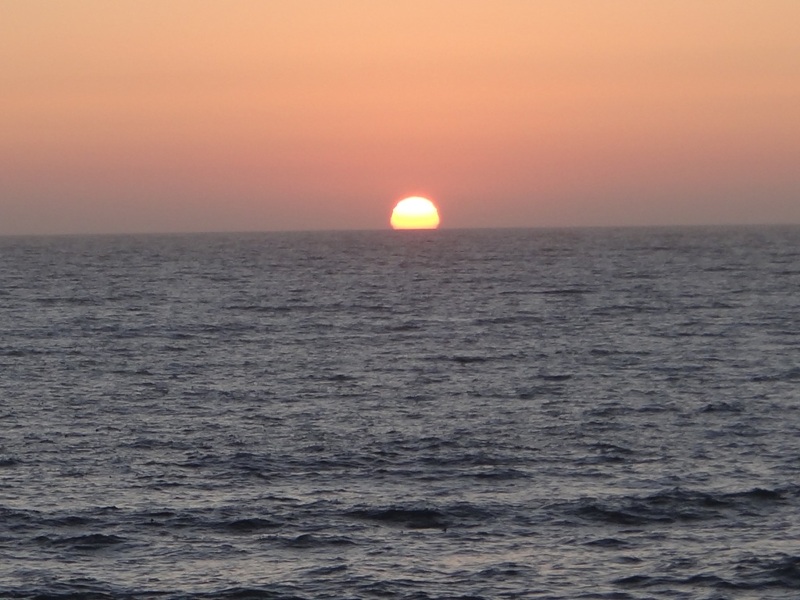 Photograph 3 - The going down of the sun - over the North Pacific Ocean. Taken at Pacifica, San Francisco. Nothing spectacular happened today. It was a sleep-in this morning and about 10:30pm we drive to Daly City (we think the name of this city has to do with the American golfer John Daly). Anne spent some of her Macy money given on her birthday and in the afternoon spent some time back in Pacifica doing administration work and domestic activities (washing our clothes etc). So it was a really good rest day. Tomorrow we have to leave early and get out of San Francisco (we are staying south of the city and to head for LA we don't need to go through San Francisco). Heading south we are going to follow the famous Big Sur which will put on a few more hours to our journey. The Big Sur is the coastline drive where the road actually hugs close to cliffs and the rugged Pacific coast. We are looking forward to that leg of the journey. What we are not looking forward to is the drive into Los Angeles. We heard it's a crazy world down there traffic wise. Neil is used to left hand drive vehicles and semi-experience in freeway driving as long as our Charlotte (GPS) is on track. On a final note regarding San Francisco it is a fantastic city. We needed at least a full week here. They say the three most three beautiful cities in the world (for scenery) are Rio de Janeiro, San Francisco and naturally Sydney. San Francisco is unusually cold in summer because of the Pacific Ocean and the bay on two other sides. Mark Twain once stated "The coldest winter I ever spent was a summer in San Francisco" - so true we are wearing coats!! Apparently only 20 klms away is a 35 to 40 deg C heat wave. Cheers.